“Colors of Spring” is an original oil painting by Robert Woltanski, resident of the Keystone State, Pennsylvania. Robert is a Quadriplegic and paints with a brush held in his mouth.This greeting card was reproduced from an original artwork by Robert Woltanski for THASC Sales Co. which has employed a unique group of handicapped artists who create art to help rehabilitate themselves. They gain self-respect and pride through their artwork. As I was driving through my neighborhood this morning I noticed that almost everyone in my community had manicured lawns and bushes with pretty flowers in a row. All except one. This house was a replica of Robert Woltanski’s garden in his greeting card painting above. Instead of a lawn there were tons of wild flowers all growing together and I wished that I had done the same thing with my front lawn: colors upon colors, all different lengths and sizes and so simply beautiful and so unique. the Palace of the Medici family who were the rulers of Florence during the Renaissance. The Palace was bought by Cosimo I’s wife Eleonora di Toledo and after being greatly enlarged, became the Medici family’s new residence. Despite its imperial dominance and décor, the Palace is not as admired as its grounds, the Giardini di Boboli, or the Boboli Gardens The development of the Gardens span 400 years from the 15th to the 19th centuries. One of the highlights is the “Viottolone” pictured to the right. As you can see, the Viottolone , or large avenue, leads all the way to the large pond called the “Isolotto”. 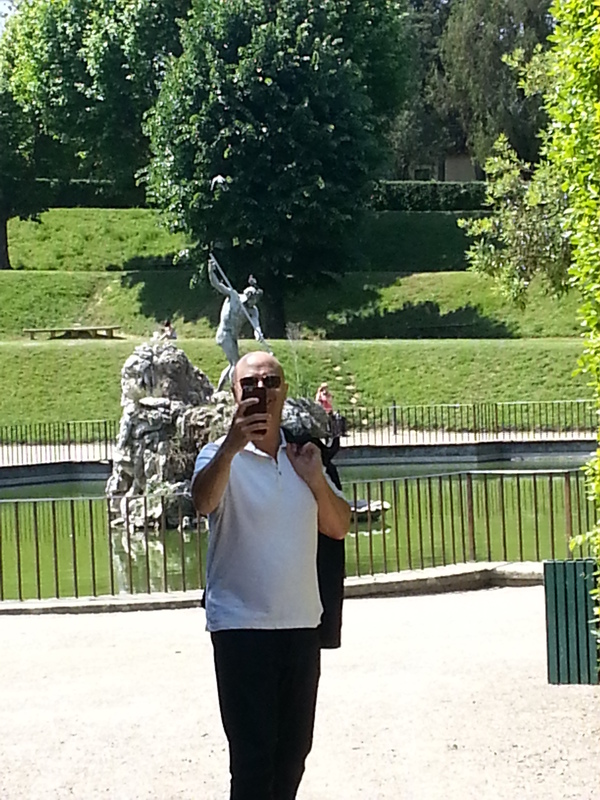 Perseus on horseback is emerging from the pond. 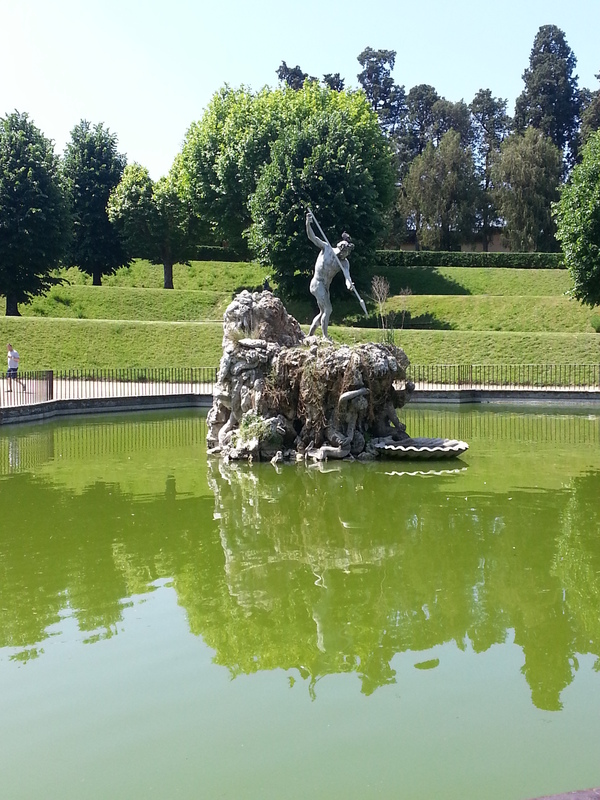 Another beautiful fountain is “Neptune’s Fountain, pictured below and called “The Fork” by Florentines because of his trident. 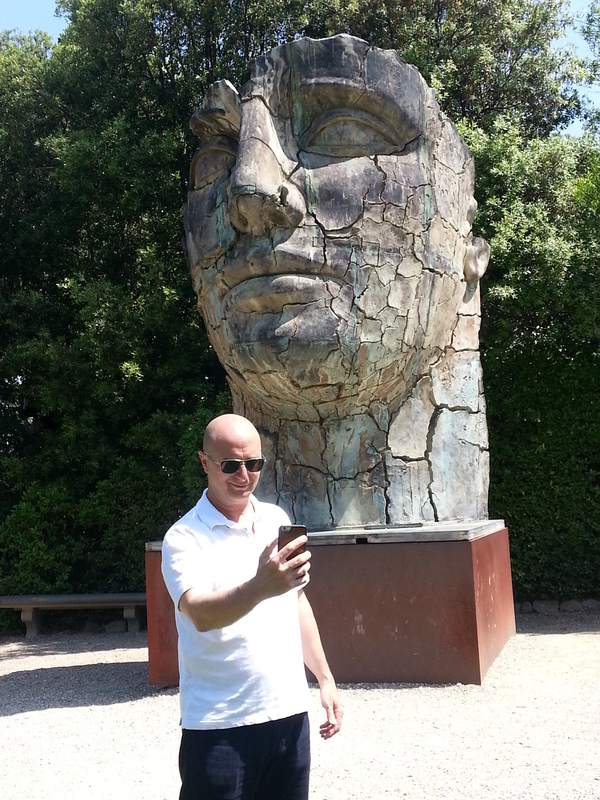 The Boboli Gardens offer the perfect place to escape the hot summer days in Florence. 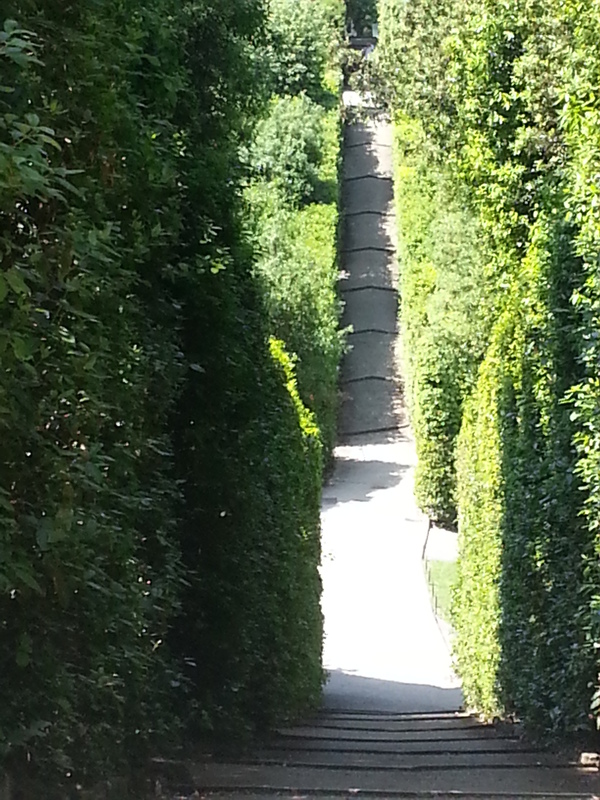 The side avenues off the Viottolone offer the perfect spots to relax and enjoy the tranquility of the Gardens. Most of our own gardens offer the same place of relaxation on a much smaller scale than the famous Boboli, and Robert Woltanski brings each of us through his THASC greeting card to the special place outside our back (or in some cases, front) door. Have a lovely Spring weekend in your garden or backyard. See you on Tuesday with another recipe from THASC’s kitchen. Ciao a presto. See you soon! 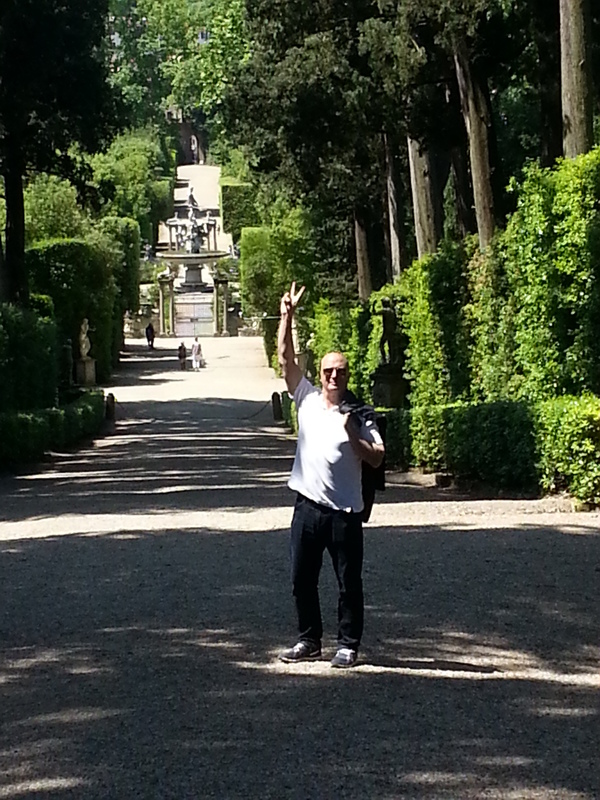 You’re right, Dana, Boboli is a garden wonderland! Not much time left for Spring but look at this beautiful summer weather we have ahead of us!!! Spring in Rhode Island is beautiful with the many different colored flowers in bloom and your story reminds me to be more aware and appreciative of my surroundings. Your story, also, inspires me to return to Florence to experience, once again, its amazing sights, scents, and colors. I love this blog as it adds beauty to my day by sharing beautiful art and lovely stories. Mille graze, cara Maria! Dear Rosaleen, Once again I am thrilled to see your comment was posted!!!! The Tuscan countryside is an unforgettable experience topped by the magical Boboli Gardens. I couldn’t imagine not visiting them each time I am in Florence. Thank you for joining my blogs and for your sweet comments!! !